The lifters that are believed to have contained one ton of crystal meth, or shabu. Photo courtesy of PDEA Director General Aaron Aquino. Philippine officials believe that drug smugglers are becoming “bolder” after a ton of ‘shabu’ was slipped past the Bureau of Customs. Speaking yesterday (Saturday August 11), presidential spokesman Harry Roque said he believed manufacturers and smugglers were becoming bolder due to dwindling supply amid the ongoing war against drugs. “We view the latest reported foreign drug shipment as a sign that big-timer drug manufacturers and smugglers are becoming bolder with a dwindled local supply as they feel the pressure from the government’s campaign against illegal drugs,” he said in a press statement. He also pledged that the government would get to the bottom of the most recent case, which involved shabu worth 6.8 billion pesos believed to have been smuggled by a Taiwanese syndicate. “Our authorities are now working with their foreign counterparts to help with the probe,” he said. On Friday, the Philippine Drug Enforcement Agency (PDEA) said billions worth of shabu might be already circulating on the streets now after the agency seized four empty magnetic lifters from a warehouse in Cavite. 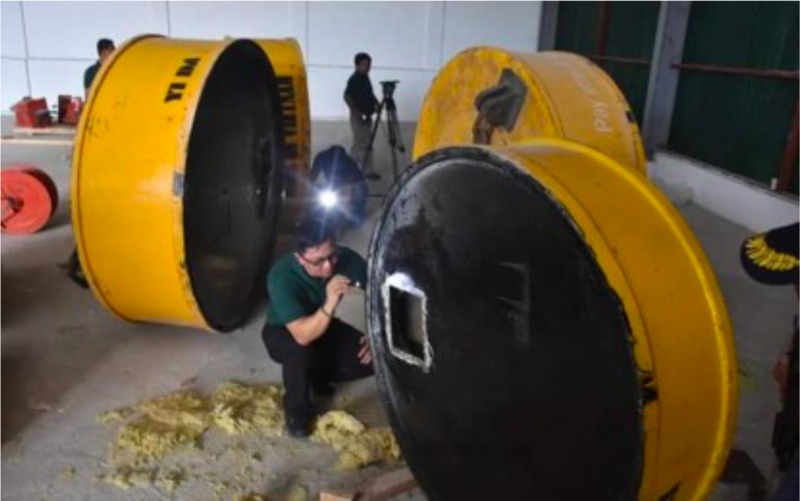 PDEA Director General Aaron Aquino said the magnetic lifters in question were already empty but drug sniffer dogs had positively detected traces of illegal narcotics. “This is very saddening, 6.8 billion pesos worth of illegal drug are now circulating anew in our streets,” he added. Aquino said initial information revealed that the illegal drugs came from Taiwan [Republic of China] and the syndicate used Malaysia as trans-shipment point. He also suggested that the notorious Golden Triangle Syndicate of drug smugglers was behind the shipment. Meanwhile, he said law enforcers were continuously conducting backtracking investigations to determine the personalities involved in the operation. He also said that the PDEA had at least 19 persons of interest, including 11 Chinese nationals, but could not reveal any names yet. He added that the PDEA is working closely with its international counterparts in China, Malaysia and the USA as it continues its investigations.